SG Budget Babe: Is Home Insurance Really Necessary? 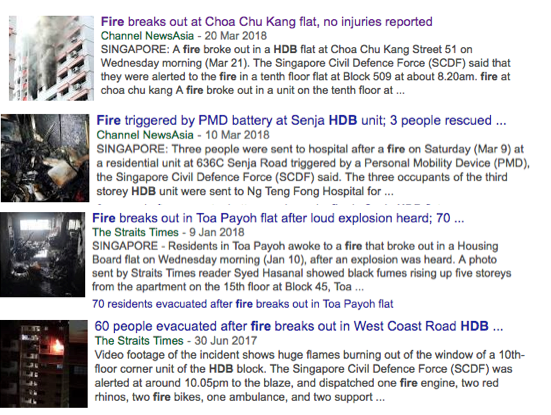 Considering how you already have to pay for your mandatory HDB fire insurance (or even a mortgage fire insurance as well, for those of you on a bank loan), do we really need to still get home insurance? Many people mistakenly believe their house is completely covered for, but the truth is far from it. 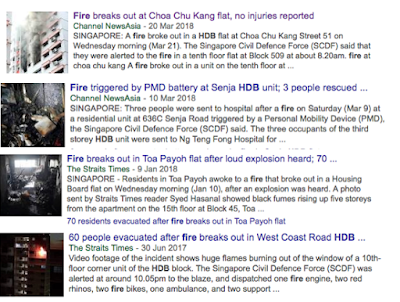 HDB fire insurance only covers for damages to core structures provided by HDB (eg. beam collapse, walls or flooring), whereas your bank’s mortgage fire insurance mainly protects your bank’s financial interest and not yours. What that means is that in the event that your house (the mortgaged property) is damaged by a fire, the bank can make a claim on the policy to protect themselves in the meantime. This works in the same way for private properties such as condominiums where the management requires you to get fire insurance. This enables the management group to make a claim on the policy to restore the premise to its original condition, should anything untoward happen. Thus, in the event of fire, if you solely rely on the abovementioned policy(ies), you most likely won’t be able to claim for damages on your house contents. That includes stuff like your furniture, built-in wardrobe, jewelry, electronics and more! 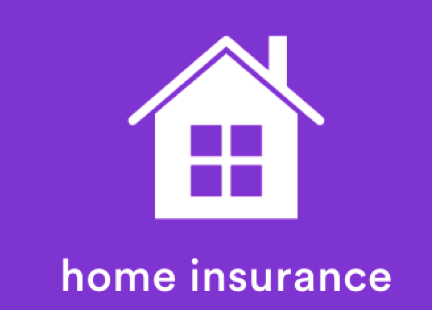 A (home) contents insurance policy has to be bought separately, if you wish to obtain coverage for those items; and you should, especially if you’ve spent a significant amount on your renovation and/or keep valuables at home. Only covers damage to your home structure, replacement of any original fixtures or fittings by HDB / the rebuilding of your home for landed properties. Does NOT cover damage to home contents in the event of fire. Covers the contents in your home, renovation works, home repairs and incidental expenses incurred for the alternative accommodation period, etc, in the event of fire, burst pipes, natural disasters or burglary. - Your home contents: furniture, mirrors, domestic appliances, AV equipment, electronics, etc. - Alternative accommodation and quality of life: expenses incurred for when you’re unable to stay in your insured home, including rent, laundry, daily necessities, etc. Back in September last year, I did a quick review of the various insurers that offer home insurance here, so I’m adding onto that list with today’s review of FWD after having gone through their policy coverage with its terms and conditions. From as low as $31 a year, the value offered in terms of what you’re getting covered for is extremely compelling (compared to if you were to be uncovered and something unfortunate strikes). You do not have to pay anything when you claim. On the other hand, most of the other insurers require us to pay at least $100 for loss or damage caused by burst pipes or a natural disaster, whereas another local insurer requires an excess payable of $350 for each and every claim made on personal effects, home contents and renovation. Probably not what you want or can afford when your house has just been ravaged! Needless to say, your policy premiums will depend on the insured amount, and in the case of renovation, a minimum of $50k - $100k coverage sum is the lowest you can opt for. However, do you really need to cover the entire cost of what it took you to renovate your house before you first moved in? FWD allows consumers to choose from $20k and up so we can get protected without overpaying for insurance. Rental, laundry, daily necessities, toiletries and other expenses that may be incurred during the period where you have to find alternative accommodation since your house is no longer habitable, FWD home insurance covers for it as well. In the event of a power failure due to a burnt fuse or malfunction of power supply socket, FWD will also cover the cost of repair for such electrical services. In addition, should you need to clear any blockage in your pipes or floor trap, or if your air-conditioner is not working due to a fault or mechanical malfunction (not wear and tear), the costs of repairs will also be covered. Moreover, should you require the help of a locksmith if you’re unable to enter your home or any rooms within, you can also claim for this once every year. Available for just $2 or $3 respectively per annum if you wish to add those on. 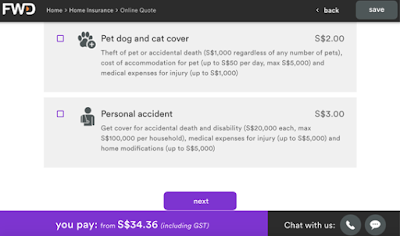 If you’re also convinced by FWD’s home insurance offering as I am, you can get your free quotation here, and don’t forget to utilize their 20% discount right now with the promo code HOME ! Click here to learn more about FWD’s other ongoing promotions as well! Disclaimer: This article is sponsored by FWD, but all opinions are of my own. My quote was obtained discreetly without FWD knowing that it was me who was enquiring on the other end of our Internet connection.